Microgaming invites all of its players to enjoy a one of a kind gaming experience through this video slot machine, Pure Platinum. The entire game is themed around Platinum and this is why the game is called Pure Platinum and this is also why the entire interface of the game is made out of platinum. Not only the interface, as the symbols are all made out of the same element. 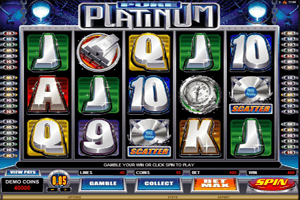 Play Pure Platinum Slot here. These symbols include card symbols, from 10s to Aces, platinum bar symbols, platinum rings, Platinum watches, Platinum cards, Platinum records and the Platinum logo of the game. The game comes packed with plenty of line payouts and special symbols that players can check by opening the paytable of the game. They can open the paytable by clicking on the View Pays button at the bottom left corner. The Platinum record is the scatter bonus symbol of the game that can trigger a number of free spins to players. The amount of the awarded free spins depends on the choice of the players. All what they have to get is 3 or more scatters on the reels .They can pick 50 free spins with 1x multiplier, 10 spins with a 5x multiplier or 25 spins with a 2x multiplier. The logo of the game is wild and can substitute for all symbols (except the scatter record). There is also a gamble game that enables players to double that they have won.